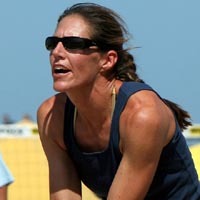 Straton did not play in the first three events of 2005 due to pregnancy, but still ended the year ranked seventh in blocks (116). In 2001, Straton earned her first victory at Muskegon with Linda Hanley. The win gave the team two records, as they were the lowest seeded women's team to win an AVP event (tied - seventh seeds) and the oldest team (combined age) to win a pro beach tournament (71 years, 10 1/2 months). She competed in the Sydney 2000 Olympic Games for Australia with Annette Huygens Tholen. Straton now lives in <?xml:namespace prefix = st1 ns = "urn:schemas-microsoft-com:office:smarttags" />Redondo Beach with her husband, Greg, who works on the beach volleyball television crews. Born in Minneapolis, Minnesota, she has dual citizenship with Australia. Took the 2002 season off due to pregnancy, and gave birth to her daughter Alexandra in September of 2002. Her son, Zachary, was born in February 2005. If she weren't playing volleyball, "Stratty" says she would be a personal trainer or sports scientist as she graduated with honors in exercise physiology. Has an older sister, Jennie, and lists her mother as her role model. Her favorite band is The Waifs, and chocolate is her favorite food.